The eyebrow area will be slightly red after the procedure and color will appear very dark. This is normal for the procedure and part of the healing process. The color will fade by up to 40% as it heals. In the following days, the eyebrows will continue to be dark and you will notice slight scabbing. Do not pick at the scabs as this may damage the skin and the outcome of the microbladed area. The eyebrows will lighten up in color as it heals. No downtime is required after microblading procedure. It takes approximately 7-14 days for the brows to heal over, and about 1 month for the color to fully set in. You’ll notice the color is very light right after the two weeks after healing; the skin will have an opaque milky looking quality to it. This is known as the milk skin and is common in tattooing. This is due to the tissue still healing from the inside out even though the surface of the skin is healed. True color will reveal itself once healed. 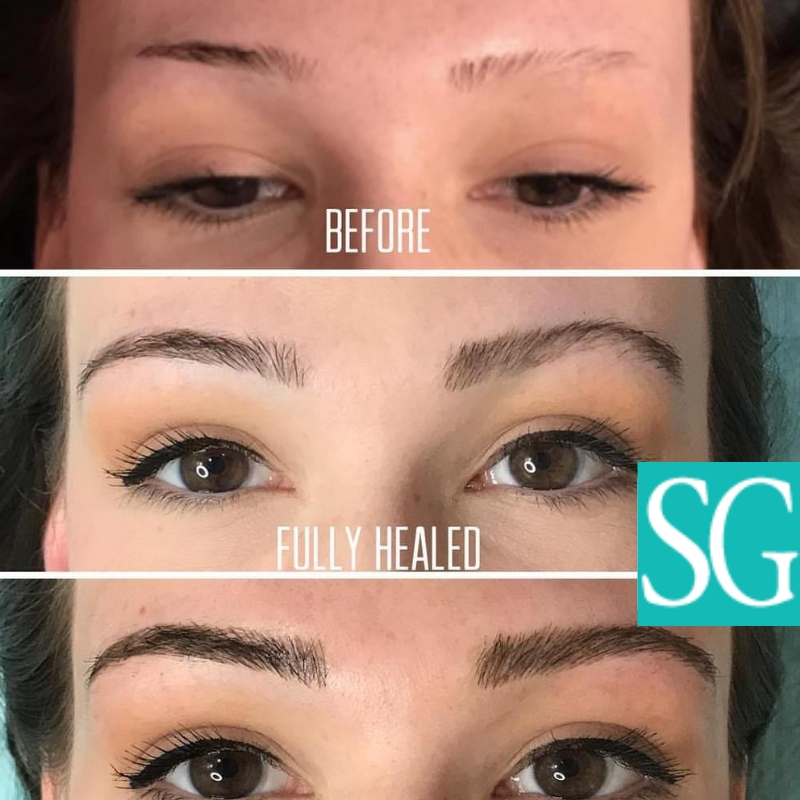 Touch up sessions should not be done earlier than 4 weeks after the initial microblading session as pigment color has not fully settled into the skin. Most importantly, this is to prevent scar damage as the tissue requires time to completely heal. The pain level for the procedure is considered mild to none. Prior to the procedure, your brow technician will apply a topical anesthetic to numb the area, and also reapplied during the procedure. Everyone responds differently to anesthetic; depending on the client, the feeling of the procedure has been described as light cat scratches to not feeling anything. Topical anesthetics used may contain lidocaine, prilocaine, benzocaine, tetracaine and epinephrine. As with all cosmetic procedures, individuals should not make their choices lightly. We always recommend clients do their research, understand the procedure and compare different artists’ work and portfolio when making their decisions. Our brow technicians will do their utmost to shape and style the eyebrows to the clients satisfaction prior to the procedure. Every effort will be made to achieve an even appearance, but please realize our faces are never perfectly symmetrical. Uneven appearance can be fixed during the touch-up session. Pigment discoloration and color correction can also be fixed during the touch up session. Microbladed brows will eventually fade away if no additional touch ups are done. Clients are able to cancel or reschedule appointments at any time with a minimum of 24 hours notice prior to the appointment time, otherwise, a fee will be charged. To book a reservation, you must provide a valid credit card that is in your name. No charges will be made at the time of booking. For a more detailed list of policies and associated fees, please click here.